Adreno-Lyph by Nutri West is a great product. Recommended by my provider for adrenal fatigue. Half tablet of Adreno-Lyph-160 by Nutri West goes a long way. It helps with histamine issue too. Adreno-Lyph by Nutri West was recommended to me by an herbalist years ago and has really worked well for me. Your adrenal glands are important‚ since they impact many of your major bodily functions‚ either directly or indirectly. Stress and an unhealthy diet filled with carbohydrates and processed foods can dramatically weaken your adrenal glands. Low adrenal function can cause your body’s health to suffer and lead to issues with your digestive system. 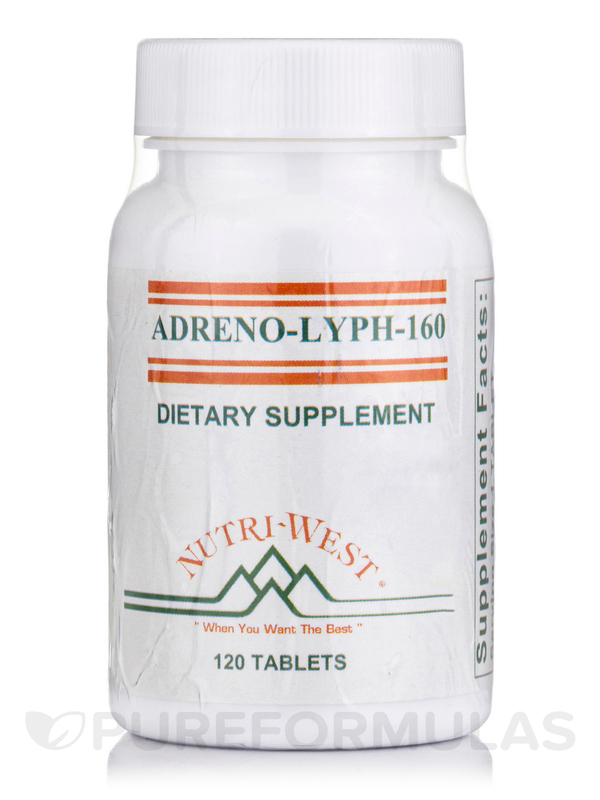 Nutri West’s Adreno-Lyph-160 provides your body with the support it needs to improve the functioning of your adrenal gland. This supplement contains a high concentration of vitamins‚ amino acids‚ and minerals to promote healthy development of adrenal tissue. Vitamin C‚ which may improve the health of your eyes‚ skin‚ and immune system. Bioflavonoid Complex‚ which may strengthen blood vessel capillaries and improve the health of connective tissues in the body‚ while also reducing inflammation and fighting harmful viruses that enter the body. Pantothenic Acid (vitamin B5)‚ which assists in treating health concerns that range from fatigue to joint pain and stiffness. 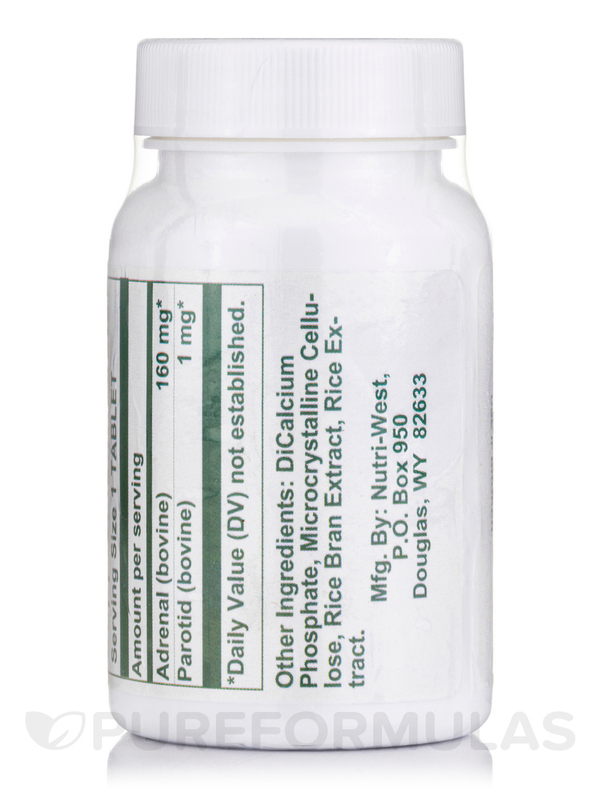 DL-Methionine‚ which is an amino acid that aids the detox process and helps relieve pain. Choline Bitartrate‚ which improves muscle control and memory by helping your cells produce more neurotransmitters. Vitamin B1‚ which aids your metabolism while helping your body process carbohydrates‚ fats and protein molecules. Vitamin B2‚ which may help your body process essential vitamins and promote a healthy metabolism. Vitamin B6‚ which supports the body’s synthesis of neurotransmitters‚ amino acids and glucose. Niacinamide‚ which may treat headaches while improving circulation. Magnesium‚ which is beneficial for growing healthy and strong bones‚ while also helping your body produce hormones and stabilize heartbeat rhythms. One bottle of Adreno-Lyph-160 by Nutri West should last for over one month at the recommended dosage of one to three tablets daily. Nutri-West provides nutritional supplements to health care professionals in order to optimize their patients’ wellbeing. It was founded in 1981 and has expanded into a worldwide company with state-of-the-art‚ environmentally-friendly manufacturing and packaging processes. Its products are hypo-allergenic and have been formulated for the highest quality. 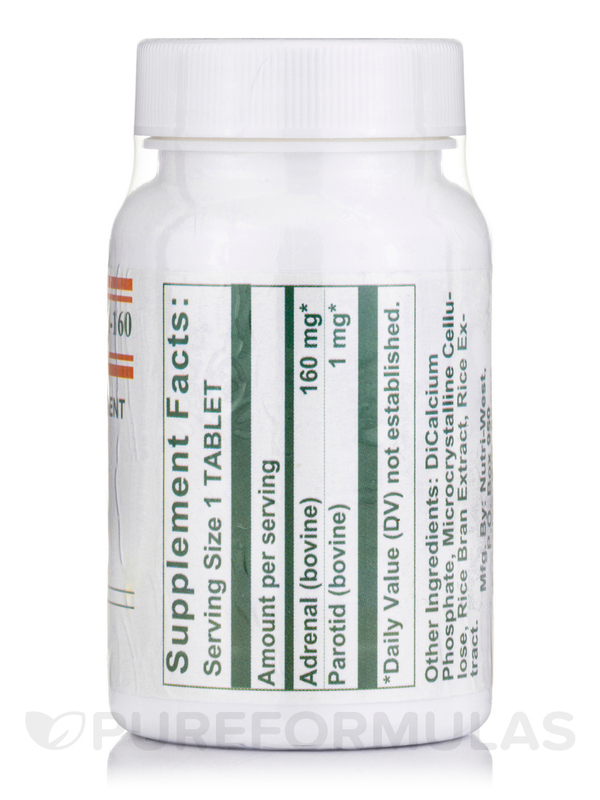 Adrenal Concentrate Each Tablet Supplies: Tissue Concentrates (not extracts) of bovine source from Adrenal 160 mg‚ Parotid 1mg. Adreno-Lyph-160 by Nutri West helps me handle stress and helps my energy levels! I was struggling with fatigue and just being able to make it through the day before my chiropractor recommended Adreno-Lyph-160 by Nutri West. I feel alive again! This is a life experience for me with this type of medication. I started taking Adreno-Lyph-160 by Nutri West in 1999. I have Hypoglycemia. My homeopathic told me. He said I cannot get rid of it but I can control it. So, that is what I have been doing since 1999. I feel wonderful and can eat foods I never could. For example, If, I ate a piece of bread I went wild. Now, I can eat all foods without reactions. Thank you Adreno-lyph-160 and Adreno-lyph-sym. I tend to be 'hyper' and Adreno-Lyph by Nutri West balances me out. I understand that it is an adaptogen and will smooth out the temperament... calming if that's needed, and a pick-me-up if that is needed. I ordered Adreno-Lyph-160 by Nutri West as my doctor (kinesiologist) recommended it for me. Adreno-Lyph-160 helps the adrenal gland which in turn helps with stress and has even helped with my former asthma. I continue to use this as it helps. Cannot live with out this! Before I was refered to Adreno-Lyph-160 I would get extremely tired during the day and had to use caffine to stay awake. I had no idea it was my adrenal gland. I now take 1 pill at 11:00 am and 3:00 PM and experience no fatigue what so ever and live caffeine free. My chiropractor prescribed Adreno-Lyph-160 by Nutri West and they help with my jaw clenching problem and irratable issues. When I take them they work wonders! Can you take them after 3 and will it make you sick ,if you take on an empty stomach?